"For centuries horses have been schooled in-hand within the classical schools fo riding, yet today work in hand is often forgotten, set aside as unimportant, or thought to be too time-consuming by modern trainers. This is unfortunate because there is much to teach horses from the ground. 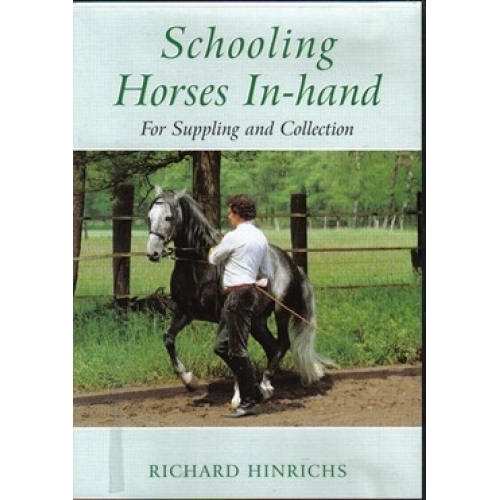 German trainer Richard Hinrichs, an acknowledged expert on schooling in-hand, presents this programme of trainers and riders to show how schooling from the ground builds trust, obedience and balance in the horse. It clearly demonstrates that in-hand work is an excellent way of supporting and complementing work under saddle, and can be especially helpful for riders striving to achieve the higher level movements for dressage competition. There is something here for trainers of all levels." Richard Hinrichs trained at the Spanish Riding School in Vienna as a young man. Today he performs widely with his Lipizzaner and Andalusian horses demonstrating the fine art of classical horsemanship - 45 mins running time. A must watch for all horse lovers!